Growing up, I quickly realized that there were lots of people better than me at lots of things. Needless to say, that bothered the eight-year-old me, it bothered the eleven-year-old me, and it still bothers the fourteen-year-old me. I used to search and search, trying to find that mythical “thing,” the one that I was the best at. It’s not surprising that I never found it. But somewhere along the way, I found writing. And so whenever I failed at yet another “thing,” I went home, and I wrote about it. I wrote for months and months, filling pages with rambling and ranting, before I looked back and thought, Hey, some of this is kind of okay. So I started writing some more. In the beginning, I looked at my writing in terms of how good it was compared to other people’s writing. That’s when I came to the same conclusion I had come to years before: there are so many people better at this than me. And the ever so mature eleven-year-old me decided to give up. I wondered why should I write when other people can write better? I picked up my search again, thinking, surely, there must be something I’m amazing at. But disappointment continued to greet me and I found myself continuing to vent my petty frustration out on paper. So I grudgingly decided to continue writing, as long as that writing never saw the light of day. And one crazy morning, I read back my writing and thought, Hey, I kind of like this. It didn’t matter that I liked some other person’s writing more, because I felt like I had something to say. I felt like my tiny voice deserved to be heard. I began to focus on the little things; on whatever it was that inspired me. It didn’t matter whether it was a little girl in rubber boots or the quiet at night–I wrote about it. I stopped wondering if it was good–I just wrote. And if I finished a thought and didn’t like it, I just stashed it away in my desk to discover some day in the future and laugh about what a silly child I was. 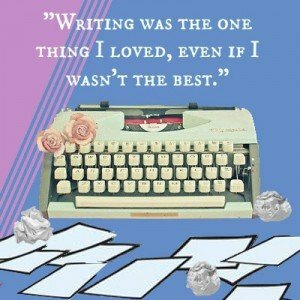 I started to realize, writing was the “thing” I had been looking for. Not because I was the best at it, but because it was the one thing that I loved even if I wasn’t the best. I was finally able to stop searching; partly because I felt I had found what I needed, but mostly because I was too busy writing. I love this article because I can relate to it. I’ve always wanted to be the best at something, but when it comes to writing being the best doesn’t matter anymore. Great job!